Handmade Sterling Silver Thai Hill Tribe Cuff Bracelet, "Serene Wave"
A talented Karen hill tribe silversmith handcrafts this delightful cuff bracelet with oxidized accents. 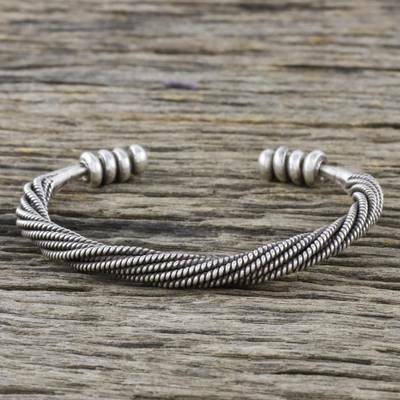 Presented by Achara of Thailand, the sterling silver cuff is decorated with a spiral of ropelike strands that travels the length of the cuff. Dainty rondelle beads of silver complete the attractive design at either end.